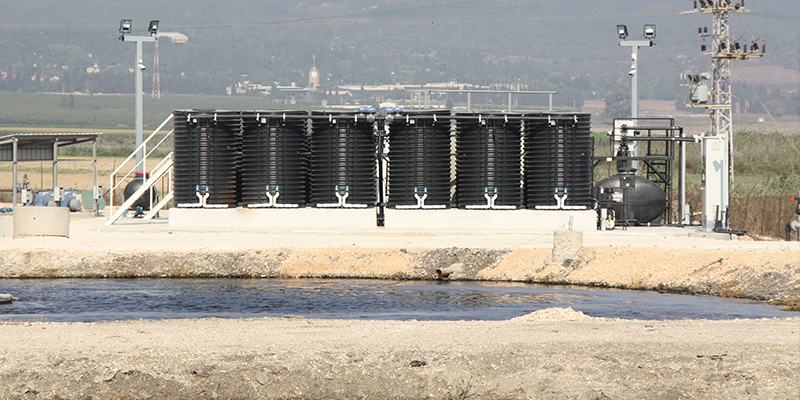 Arrays of MABR units at the Moshav HaYogev wastewater treatment plant. HaYogev is a residential development in the rural area of Jezreel Valley, with 1,000 homes, agricultural fields and dairy farms. The local treatment facility, located in an open field next to small farms, receives wastewater from HaYogev and Midrach Oz. This local community is committed to above-par environmental standards, thus ensuring this particular area of the Jezreel Valley is well maintained. The customer was looking for a new local wastewater treatment solution to replace an existing pond system, which was no longer suitable for treating the wastewater because of its high level of nutrients. A new state-level regulation concerning reclaimed water required all wastewater treatment plant operators to reduce nutrients in the discharged effluent stream. The solution had to be odorless and quiet, have low power consumption, and make use of the existing pond and structure. The enhanced HaYogev wastewater treatment plant incorporating the MABR product solution has been operational since September 2016, treating 125m3/d (33,000 GPD) and producing high-quality reclaimed water that complies with state regulations concerning water reuse in agriculture. Contact Fluence to learn more about our MABR wastewater treatment solutions, or to discuss your next project with our experts.